Replace your old-fashioned shower curtain and say goodbye to that dreaded water overspill with DreamLine's D32872L-09 Hinged Shower Door. It is a 52 x 72 swing door flaunted by the Unidoor-X collection. Graced with clean lines and a sleek, frameless design, its streamlined elegance will give your bathroom that extra something while the chic-looking glass panels spell luxury. These panels are crafted from ANSI-certified tempered glasses that are proven durable and practically unbreakable. The contrasting crystal clarity and the mystical satin black finished hardware provide the perfect finishing touch! 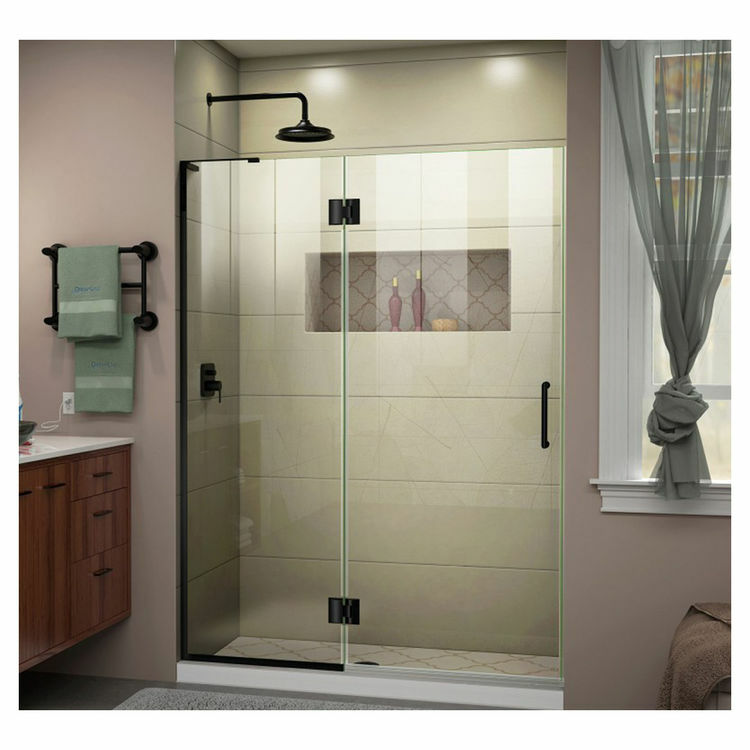 This DreamLine Shower Door boasts ClearMax, DreamLines very own stain-resistant coating that makes this door incredibly easy to clean. Any house-proud consumer who stresses over extra cleaning will blow hot and cold about buying a different shower door! This DreamLine Hinged Door indeed is the ultimate luxury. It is designed for a left-wall installation with a walk-in opening of 27". Included in the package is a 24" wide hinged panel. In addition, the solid brass hinges are self-closing, enhancing ease of use and convenience. It is backed by DreamLines 1-year manufacturer warranty a warranty that you never have to use! Add to this a matching SlimLine shower base (sold separately) and your bathroom becomes a fashion-forward haven. As always, DreamLine never fails to effortlessly blend elegance and beauty. DreamLine delivers on its promise to be a world leader on exceptional luxury bathroom solutions highly-recommended by consumers without reservations year after year. Shipping Dimensions 80.0" x 43.0" x 16.0"
Shipping Dimensional Weight 311.50 lbs.